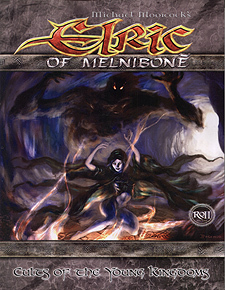 Cults of the Young Kingdoms expands upon the material found in the Cults chapter of the Elric of Melnibone rules. Herein you will find more information concerning the natures of the Lords of the Higher Planes, new cults, new Gifts and Compulsions, new religious approaches and new professions related to them. Essentially this book is for those Elric Games Masters and characters who wish to immerse themselves in the ways of Law, Chaos, Elements and other supernatural forces abroad in the Young Kingdoms. It aims to extrapolate material from the Elric saga, adding depth to the intrigue Michael Moorcock has created, allowing Games Masters and Players to become greater exponents of the higher powers as their characters struggle to make sense of the world around them.